After trying to get through the Dead Zone (I wasn’t able to), I decided to give Dragon’s Dominion a second shot. First, I wanted to fight the Dragon Lord, though. It actually wasn’t very difficult. Sure, the Lord was able to knockout a few of my party members on every turn, but it was an outdoor battle, so that problem was easily solved with Moon Ray. He fell and I got nothing to show for it. I entered the Dragon’s Dominion (it’s a cave). The first half of this dungeon was deceptively easy. I was just fighting a lot of Wyverns, Earth Wyrms and Cloud Dragons, with a couple of Frost Dragons now and then. I explored most of the level and then came the hard part. Several encounters with Magic Serpents and Armored Dragons were blocking passages to some of the areas I didn’t explore yet. With difficulty, I managed to defeat a lone Armored Dragon and got to an area with a permanent health increase pool. 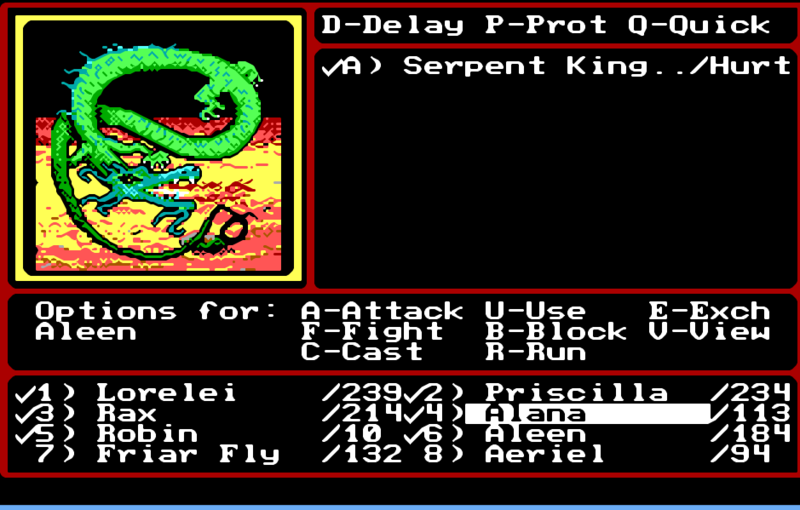 I tried the Magic Serpent, but all I could do was to use Friar Fly to keep Aeriel alive so she could Time Distort everyone out of there. Then I realized I could get to what was laid out like a throne room. There, the big encounter of the dungeon was waiting – an Ancient Dragon. In the first turn, this guy hit everyone except the two mercenaries for 2000 damage. As usual, I used Time Distortion and got out of the cave. New objective added – Payback in Dragon’s Dominion. At this point, I realized something I didn’t notice before. Using the Resurrection spell ages the caster by a year. Alana was 76. I tried casting Rejuvenate, it failed and then she was 81! I spent about 30 minutes going back and forth between Murray’s Island and Middlegate to get the rejuvenating effect that way. This sort of worked so Alana is only middle-aged now. While I was there, I also explored Murray’s Dungeon. There’s a spot there that forbids hirelings. There are also dangerous enemies, so I’ll be coming back at a later time. 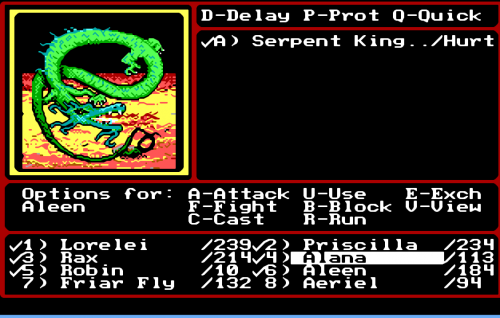 Apparently, you advance in power extremely quickly in Might and Magic II, because the Serpent King was relatively easy to kill now. It’s acid attack usually did only minor damage and with the two clerics and Moon Ray, it was easy to almost completely negate. Experience does wonders. The Serpent King barely did anything. The only issue was that the monster has a high dodge rate, so I was having a hard time actually damaging it. Still, after several dancing swords, a couple of successful back-stabs and a Disintegration or two partially failing (thus, doing 50 damage), it died and I can mark this objective as completed. What with being able to defeat legendary beasts, I decided to give the Hillstone dungeon another try. I was expecting it to be a short thing, but soon learned it’s actually several levels deep. A sometimes annoying feature of Might and Magic II are the X not allowed areas and this dungeon has a few of these, all banning half-orcs. The thing is, I was able to safely ignore some of these warnings and simply move past them. A few of them would teleport me away, though, so I’ll have to come back without Rax at some point. There was a jester imprisoned in one of the corners of the first level. He claimed he told “one bad orc joke to many”, so he got himself jailed by the lord. This game really doesn’t take itself seriously. On a side note, I like the bad orc jokes. Some people just don’t have a sense of humor. 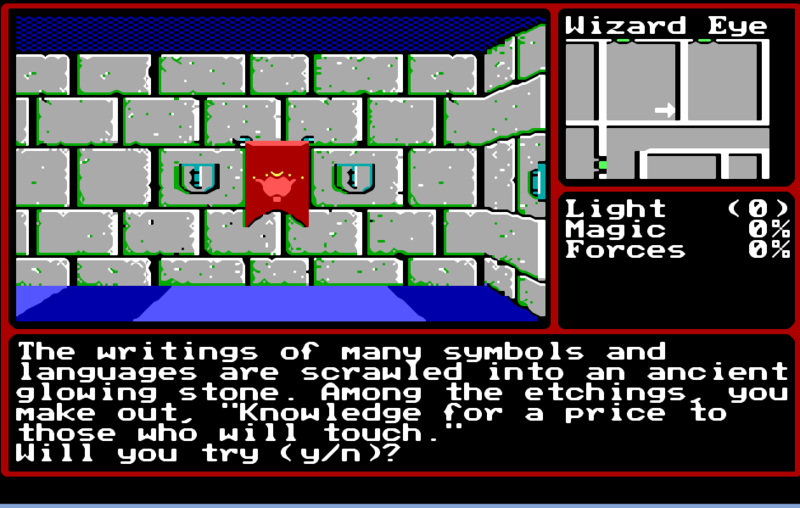 The dungeon also housed a few other things reminiscent of Might and Magic Book One. There was a place that allowed me to trade gold for experience by picking a single character to do it with. There was also an orc NPC offering me all of his stuff for all of my stuff. Remembering the hermit from Book One, I decided against it for now. Two of the No Half-Orcs areas each led to a room with a No Ninjas and No Barbarians signs, each containing the respective class items – the Coral Broach for the barbarians and the Crystal Vial for the Ninjas. Since I have no barbarians or ninjas with me, I gave both to some random mercenaries. The one No Half-Orcs area that I actually had to leave Rax back in Middlegate simply told me that a soothing melody has strengthened my party, whatever that means. Level 2 of the Hillstone dungeon was all about poison – poisonous traps and enemies that poison you. Since the only real option is the Remove Condition spell, which targets one party member, it was an extremely annoying place. I’m not sure what this did, exactly. I was exploring it, very slowly, for about thirty minutes, before a large group of Court Mages ambushed and killed my party, wasting all the time spent exploring. I actually intelligently decided to postpone drawing the map until I fully map the area. Boy was that smart! At this point, I’m slightly annoyed with my progress and I’m blaming myself, not the game. I need to figure some things out and, more importantly, I need a proper plan. I’ll spend some time going back to previous areas and figuring it all out. The party will be stronger. Much stronger!